According to information gathered by allnigeriasoccer.com, Super Eagles manager Gernot Rohr has decided on the eleven players that will take to the FNB Stadium pitch from the very first minute in Saturday afternoon's Africa Cup of Nations qualifier against South Africa, based on the team's last workout on Friday afternoon. Barring a last-minute change in plans, Enyimba goalkeeper Ikechukwu Ezenwa has been handed the goalkeeping duties ahead of South African-based Daniel Akpeyi. 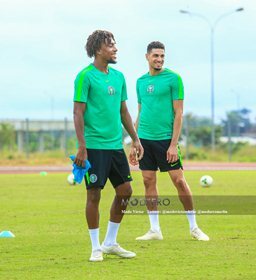 Chelsea loanee Kenneth Omeruo played alongside William Troost-Ekong and Leon Balogun in defense in the last workout and Rohr intends to stick to those three as well as Jamilu Collins. John Ogu will replace the suspended Leicester City midfielder Wilfred Ndidi, Oghenekaro Etebo will take up the second holding midfield role while Alex Iwobi will continue in his favored position as a playmaker in the absence of Obi Mikel. Rohr went for continuity in the selection of his strike-force, with Ahmed Musa and Kelechi Iheanacho tipped to start in attack.